Ground elder is growing profusely in our garden at the moment. 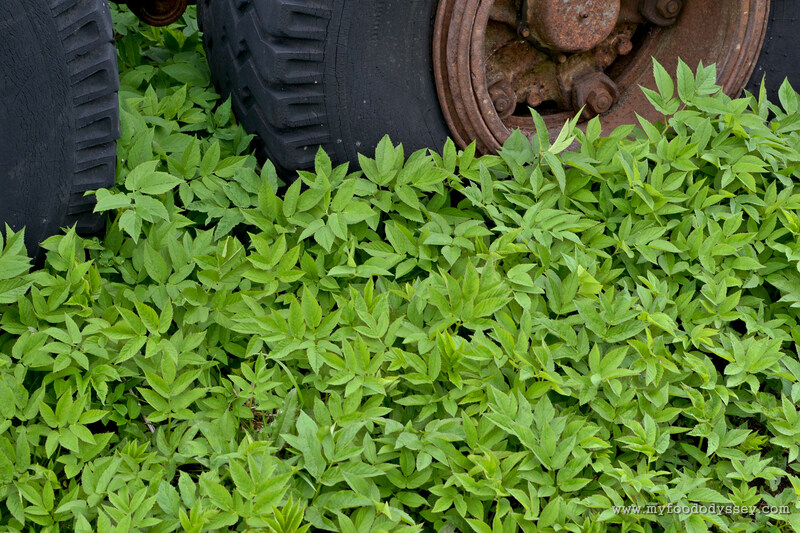 It is quite an invasive plant and can be very hard to get rid of once it takes hold. I only recently discovered that the leaves are edible. They taste a little like parsley but with the bite and consistency of spinach. Rather than bemoan the fact that my garden was full of weeds I decided to get inventive and use this natural bounty to make some tasty meals. The leaves work well mixed into a green salad. They add a hint of flavour without overpowering the salad. However, as we’re not quite into salad season yet I wanted to try the ground elder in a warm dish and decided to try it as a pesto. 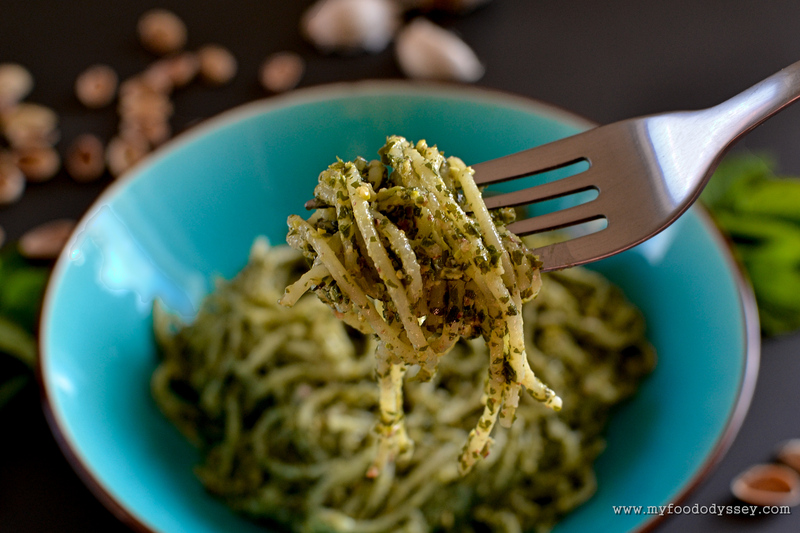 Pesto is usually made using basil leaves, pine nuts, parmesan cheese and olive oil. I have swapped the pine nuts for pistachios, which are much more cheaply and readily available here in Lithuania. As the nuts I bought were already roasted and salted and as pistachios have a deeper flavour than pine nuts, I found I didn’t need the parmesan cheese for seasoning. I’m actually not a huge fan of olive oil – I find the taste a bit peppery – so I used rapeseed oil instead. Any vegetable oil that is liquid at room temperature will work. Try to pick smaller leaves from plants that have not yet started to flower. Depending on the weather in your area, you should be able to pick leaves until well into June. This pesto is incredibly flavourful. 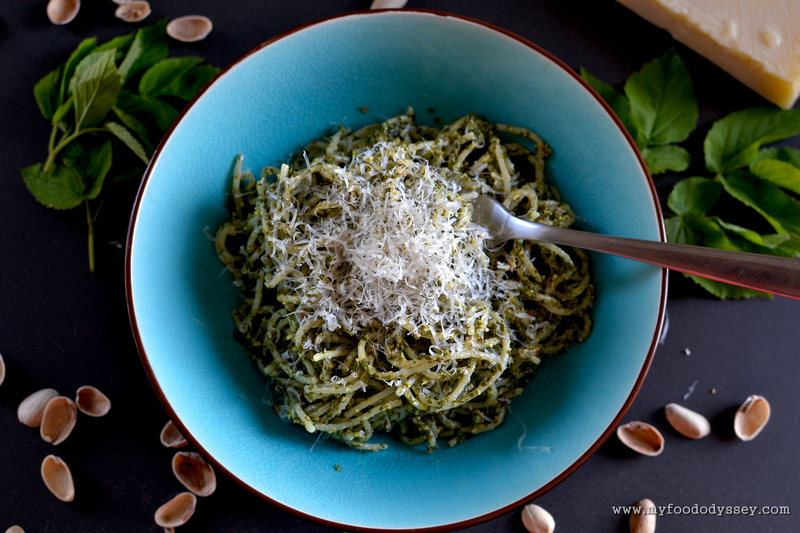 It lacks the aniseed flavour that comes from the basil in regular pesto but has a deep savoury flavour from the ground elder and nuts and a hint of acid from the lemon juice. I had this pesto for dinner stirred though some warm spaghetti. I topped it with some crispy bacon bits (not shown in photos) and a generous grating of parmesan cheese to create a very satisfying meal. 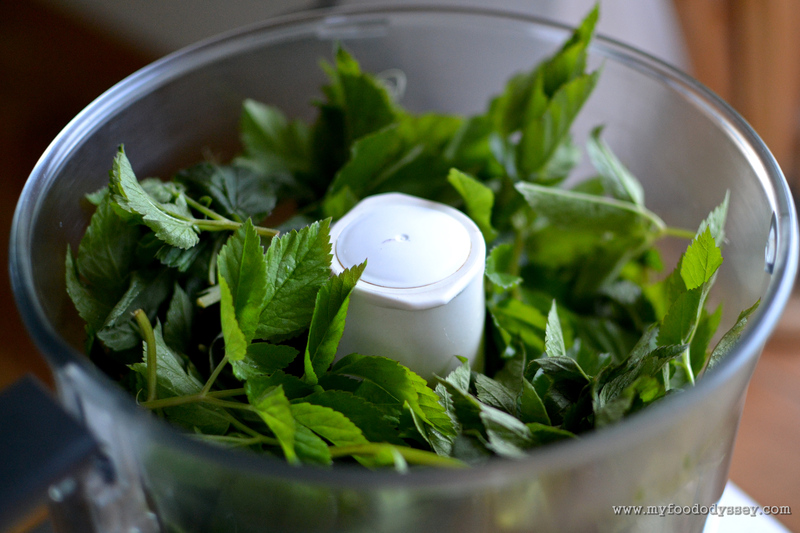 Wash the ground elder leaves and spin dry in a salad spinner or pat dry with a clean tea towel. Shell the pistachio nuts, if not already shelled. Place the ground elder leaves, pistachios, oil, lemon juice and garlic into a food processor or blender. Process the ingredients for about 30 seconds. Open the mixer, scrape down the sides with a spatula or spoon, replace the lid and process for a further 30 seconds. The final pesto should have a slightly course, grainy consistency. Taste the pesto. 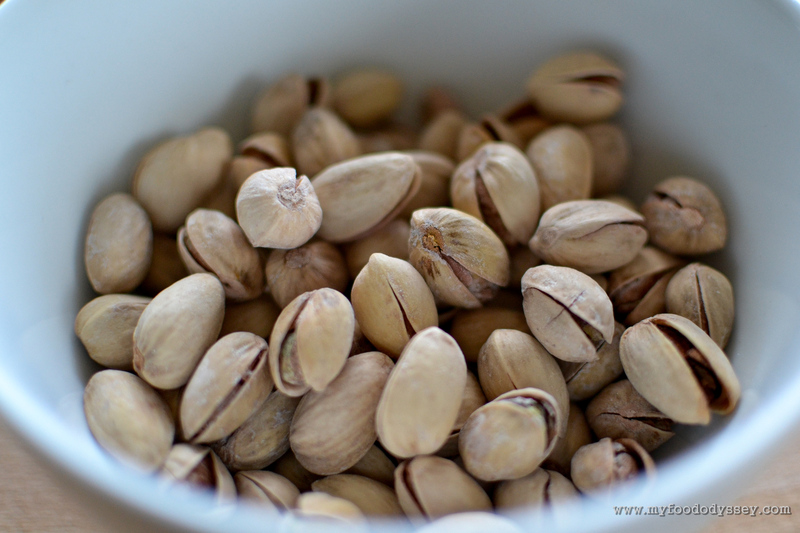 Depending on how salty your pistachios were you may need to add a little salt. I found that an extra ¼ teaspoon of salt resulted in a perfectly seasoned pesto. If not using the pesto right away transfer it to a clean jar and cover the top of the pesto with oil. 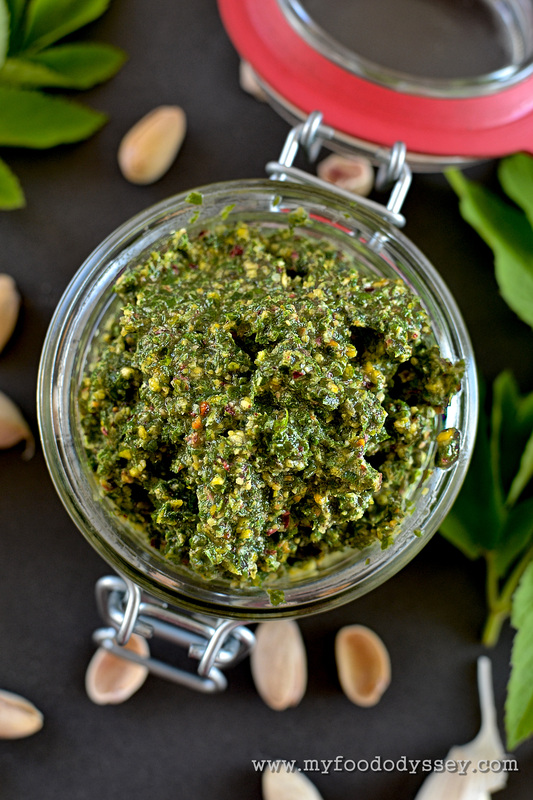 The oil keeps air away from the pesto and helps it to keep for longer. I have kept my pesto in the fridge for up to a week. It may last longer. Use the pesto as you would a basil pesto. Serve spread on warm slices of sourdough toast or stir through warm pasta for a quick and nutritious meal. This quantity of pesto is enough for two generous servings combined with 200 g | 7 oz of spaghetti. Ground elder is a member of the carrot/parsley family (Umbelliferae), which also includes poisonous species such as hemlock, fool’s parsley, Satan’s parsley, giant hogweed, etc. In the UK, there is a very easy distinguishing acid test. Ground elder is the only one with a stem that is triangular in cross section. I think it tastes a little like celery. Thanks John – that’s very useful. Please make sure it is ground elder. There are some very poisonous plants in the same family. Ground Elder is in abundance at the moment. I haven’t tried this recipe yet and have been meaning to find and try some Ground Elder. Sharing for your enjoyment. Looks amazing, but I don’t think we have any here. I’ll have to look it up. It has many names, Julia, including herb gerard, bishop’s weed, goutweed, gout wort and snow-in-the-mountain. It’s not native to the US, but has been introduced in some areas. Around here it’s just a weed. 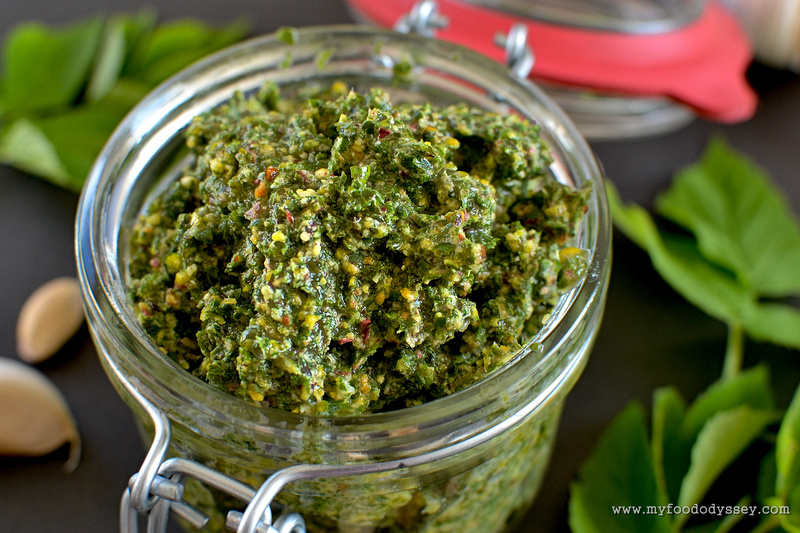 The pesto is a great way of making a silk purse from a sow’s ear! Thanks. Just planted some leaf lettuce and tomato plant and flowers. Oh Gary, your girls will love it. Go for broke and top with the crispy bacon bits – it’s divine! What an awesome discovery! I have a yard full of ground elder. Confirmed it with my MIL. Think I’ll try some of that pesto. You definitely should, Susan. She’ll think you’re cracked, but she’ll enjoy the pesto nonetheless! That looks amazing. We are huge pesto lovers in our family. 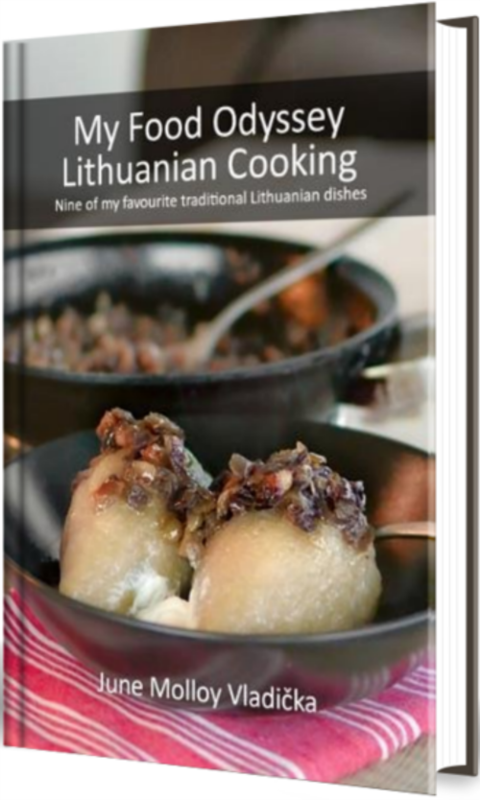 Oh go on – give it a go, Asta. You won’t be sorry! I’ll bet you pick mushrooms off that forest floor and don’t worry too much about what dogs might have been past! My dog and hens hang out near my ground elder. Just give it a good wash in plenty of cold water and you’ll be fine. I’m finding lots of them these days, Osyth. Off out to pick some dandelion heads to dry for tea! It actually makes delicious green muffins too. Oh wow – sounds interesting. Do you wilt it first or just chop it up and put it in raw? I do pour some boiling water on the leaves first. Then drain, mince finely and mix into a basic vanilla muffin. It’s also known as Goutweed.